At Khaosan World Namba , we offer you a unforgettable traveling experience. Our building is located at center of the Namba area, 3 minutes away from Namba Subway Station, 3 minutes away from JR Namba station, 10 minutes walking distance from Dotonbori Area and Shinsaibashi (The most fancy nightlife, shopping, restaurant area). Our accommodation options include deluxe double bed rooms, 3 -6 people private rooms , 6 beds female dormitory room with full amenities (make remover, face wash etc) , 10 -12 beds mix dormitory rooms in cal-pulse style All come with fresh white linen, comfy blanket with clean linen, curtain on each bed to make sure your privacy , lockers and conditioning and heating, and elevator access to all seventh floors. P/S: All our staff speak fluent English. Korean speaking speaking staff are also here! *50% CHARGE: 50% of room rate shall be charged if you inform us 1 day prior to the accommodation date. - Based on reception business hour, 08:00 - 22:00 in Japan Standard Time. If we could not confirm your arrival by 1:00 midnight, we consider the guest as NO SHOW CASE and we cancel the booking. Please note that we charge 100% for the first 2 nights and 50% for the third night in that case. - Arrangements can be made for early check-out and late check-in. Informing us in advance via e-mail is preferable. When you book 2 or more dorm beds, we cannot guarantee that your entire group can be in the same dorm room. Please book private room(s) if you wish to ensure that everyone in your group is going to be in the exact same room. Dormitory Room - We are afraid that we cannot accommodate for children under 11 years old in any dormitory room. 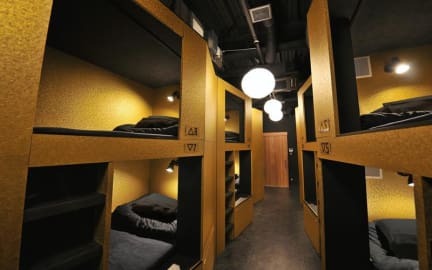 Amazing hostel in amazing city! We was really surprised by the quality of our staying in this hostel. Everything was so nice and clean and we really enjoyed our time there! The staff is always available and nice!